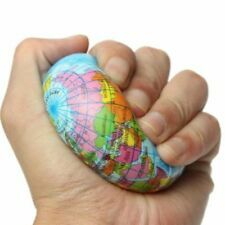 Features: 100% brand new and high quality Stress relief toy for adults and kids PU shell filled with soft sponge, useful stress relief bouncy Ball World map printed, the earliest enlightenment for babies to know the world Material: pu Filled With: Sponge Size: φ6. Inflatable globe. Easy to inflatable. Great for education, such as in the classroom, family Tutor; you also can play in the beach, pool. Color: as the picture show. Size: 76mm. Bouncing ball. It can also be a decoration in your car / house / show window / cafe. Pattern: World Map. Color: Blue. Squishy: very slow rising. Applicable age:more than 6 years old. Toddle Tots Noah's Ark Children's Toy. With Box. Material: Foam. Easy to know different country on the ball. Color: As the picture shows. It is a good gift for your lover, family, friends and coworkers. We will reply you ASAP. Inflatable and lightweight, suitable for children with small hands. 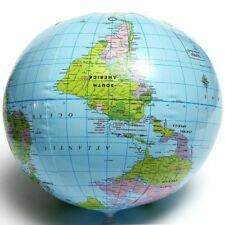 1 x Inflatable Globe Map. Detailed map of the world with major cities, rivers, and national borders. Color: As the picture shows. Due to the light and screen setting difference, the item's color may be slightly different from the pictures. Made of bouncy and squeezable foam. Stress relief by squeezing it. 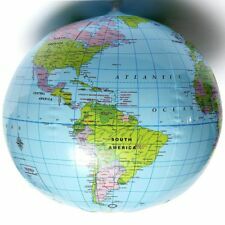 World map globe design. Palm sized globe, very convenient. An Educational/Reference World Globe. This globe in Black Tones clearly indicates international boundaries, countries, cities, latitude, longitude. 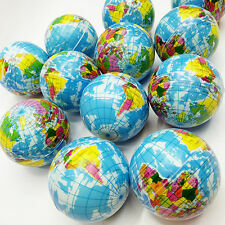 The Crisp colours of the globe makes it stand out as a high quality product. Inflatable globe. Easy to inflatable. Great for education, such as in the classroom, family Tutor; you also can play in the beach, pool. Color: as the picture show. Material: PVC. Highlights Top Secret Adventures. The pages have never been turned. Nothing has been touched, played with or opened. I wanted you to see detailed images of the complete set. 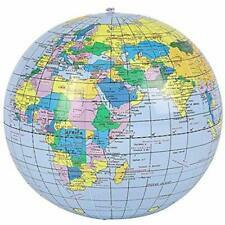 Geographical world political globe map with excellent details. - Made of Alloy, durable and sturdy. People always bought together with. The Jimmy Carter Commemorative Coin set is beautiful and educational, containing two commemorative coins honoring his presidency as the 39th President of the United States. Both coins sit within a LockTite, crystal clear enclosure affixed to a full color 5x15 inch tri-fold containing the timeline and historical record of the president. The coins are made of bronze with a gold finish and are 30mm (slightly larger than the presidential dollar coins). 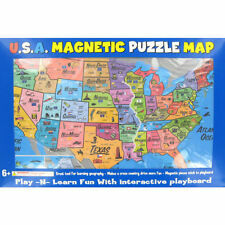 Great early educational toy for kids, let them learn more geographical knowledge. Type: Inflatable. 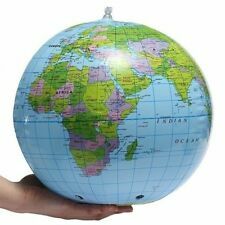 1 x Inflatable World Earth Globe Map Ball. Easy to inflatable. You also can play in the beach, pool. Educational fun toy. Map View: World. Great for geography learning. Great for education, such as in the classroom, family tutor. Features: Inflatable globe. Easy to inflatable. Includes names of all countries and major cities. Great for education, such as in the classroom, family Tutor; you also can play in the beach, pool! 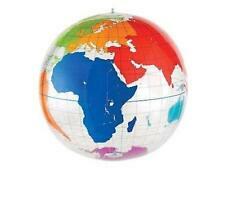 Diameter: 38cm Color: As picture Material: PVC Package included: 1X Inflatable globe toy. It is current map, include south sudan, Montenegro/Kosovo/Macedonia/Bosnia and Herzegovina new and small countries, can see the country scale, but magnifying glass should help you on this 5 in size globe. Take Off! 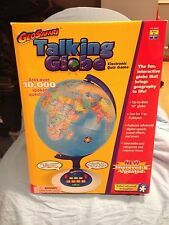 Game teaches Geography 1993 Laminated World Map Edition Complete. Condition is Used. Shipped with FedEx SmartPost. 2001 Mad Dash! Age 8 , 2 to 4 players. `Summary of Play - A set of instructions in English. `50 State Cards. Case #12455. Puzzle, new in the bag. Seal was not broken. New puzzle book. It's never been written in. Highlights Top Secret Advetures. Doing so is against U.S. and other laws. DESCRIPTION:  The New 2-In-1 Kids World Globe.  This World Globe Gives Your Child A Colorful And Detailed Daytime/Nighttime View Of The World, Including Easy-To-Read Detail Of Geographical Features.  The Sensor-Activated Globe Is Constructed With LED Lights Built In To Illuminate The Constellations In A Darkened Room. 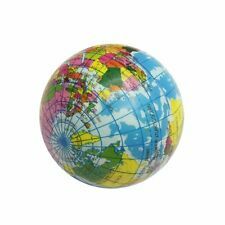  This Globe Serves As A High-Quality Decorative And Sophisticated Piece For Your Child’s Bedroom Or Even Your Family Room, And Is Also Ideal For Use In Teachers' Classrooms.  This Fun And Educational Geographic Experience Will Prove To Be A Great Gift For Any Child Or Young Adult. SPECIFICATIONS:  Overall Dimensions: 6.25“(Base Dia) X 12“(H)  Power Cord Dimensions: 48.8”(L)  Weight: 1.55 Lbs.  Color: Multi-Color  Material: Plastic, PVC  No Assembly Required. Author(s) Adrian Hill. Format Hardback. Series Title Craft S. Publication Data. Content Note Ill.(8col.). Publisher Littlehampton Book Services Ltd. We will do our best to correct any mistakes. Date of Publication 01/12/1963. Great for education, such as in the classroom, family Tutor; you also can play in the beach, pool. Inflatable globe. Easy to inflatable. Color: as the picture show. We will do our best to solve your problem. Great for children, schools, etc. A wonderful educational and trivia tool. The State Quarters folder/map includes a space for each coin design; they are mounted in the map to correspond to the state being honored. 11"W x 17"L (folded). coins not included. 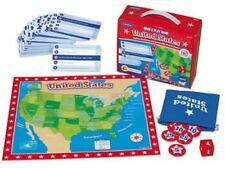 This is a fantastic Add-on set for your FAO Schwarz The Big Map. This set features 24 animals, all different! They all come in a cute storage bag. All pieces are clean and in excellent condition! This is a huge amount of striking and dramatic hand-crafted stone work. The latitude and longitude lines are very thin ribbons of polished brass, embedded through the globe. Highlights Top Secret Adventures. Puzzle, new in the bag. Seal was not broken. New puzzle book. It's never been written in. Solar Powered, no batteries required - the solar panel allows the globe to spin from eco-friendly solar energy when it is placed in either sunlight or 400LUX Light. - 14cm Globe sits on a small embedded plastic stand, will amaze almost anyone when they see it revolve continuously on its axis. The National Parks Quarters folder/map includes a space for each coin design; they are mounted in the map to correspond to the state being honored. 11"W x 17"L (folded). 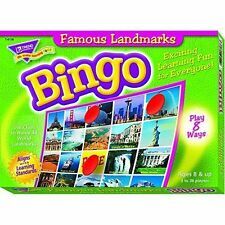 great way to learn all the national parks. Lewis & Clark Playset with Sacagawea and York in a canoe. Set does not include Seaman the dog.